Welcome to String Chaos! Click on the beads and drag them. The aim is to sort the beads in each level that way so that no white lines will connect the beads cross each other. The faster you are, the more points you get. The blue glowing beads charge up slowly. Once they are fully charged, they push all other nearby beads away. Black holes pull all beads to itself. The nearer the bead, the stronger the pull will take effect. Bead swallowed by the black hole appear again at a random position. Then take a special attention on the black ones. You can find this skill game on www.bestgames.pk. Good luck! It is the day after thanksgiving and the princesses need some retail therapy! They need some new clothes for the new year! 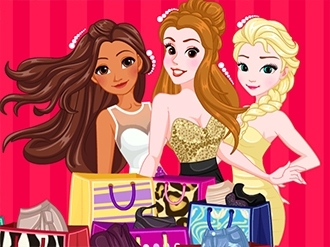 Help Elsa, Moana, and Sleeping Beauty grab al the sale items. This Black Friday is going to be insane so you need to have quick hands. Let us see who can grab the most items! Have fun and tell us your scores in the comments!